It doesn’t take a detective to recognize Sherlock’s style. Cumberbatch has a British sensibility, typically opting for more classic cuts in dark neutrals. He can go full-fledged formal in a velvet jacket and waistcoat, but his rainy day ensemble is just as pleasing to the eye. He’s the type to make a head of red curls look dapper on the carpet, but they can also read rugged with a little stubble – keep your facial hair under control with Dove Men+Care’s Sensitive+ Shave Gel. The New York Jets wide receiver also happens to be a brand ambassador for Buffalo David Bitton jeans. Decker is vocal about his wife’s influence on his wardrobe, crediting her for helping him explore styles outside his comfort zone. We have to say he takes direction pretty well, and her advice certainly looks great on him. As a politician, you can expect classic, simple suits in dark blues, grays and blacks from Biden. The Former VP adds a dose of color with his ties, and you can bet it’s in the shades of red, white, and blue. Biden’s smile is probably his greatest accessory, but his silver white hair is also very on trend. If you have similar hair texture, we recommend Dove Men+Care’s Oxygen Charge Shampoo. You probably know the name Todd Snyder from the label on your favorite pair of pants, but did you know he’s a human with excellent personal style even beyond his clothing brand? His label pushes the envelope in a manageable way (you know I’m in support of his slim cargo pants). He’s the type of designer to adopt a signature look, and his blazer and dark denim combo is a classic that will always feel fresh. A stylish guy that’s willing to divulge his style secrets? Yes, tell me more! Adam Gallagher, the man behind menswear blog I Am Galla, has a wardrobe that is well curated but totally attainable, and he does all the work for you. A guy that’s not afraid to help other guys look their best is an SG Madness winner in my book. His low maintenance short on sides long on top cut is always coiffed with just a bit of product – we recommend AXE’s White Label Night Styling Cream to get the same look. The Weeknd’s style is as on trend as his tunes. His favored silhouette is an oversized jacket, long tee, and skinny jeans, and there’s a whole GQ article about it. He is definitely a strong example of having a signature look and absolutely owning it. Idris Elba is a stylish man. He demonstrates the importance of fit, the benefits of going bold with color, and how breaking the (style) rules can sometimes make an outfit that much better. It’s hard not to fall in love with this Jersey boy…I mean, fall in love with his style. He has classic Americana down to a tee, and yes, that was a fashion pun and you love it. Just like you love The Boss. He rocks a spiky faux hawk better than most men half his age – get his look with Dove Men+Care’s Control Gel. Rami Malek’s style is interesting, but in a way that easily achievable for the average guy. I have to give a special shout out to the Mr. Robot actor on how well he does fun suiting – both color and pattern. Also, that camp collar shirt and #sockgame in the middle picture is the spring inspo pic I want you boys to be referencing when warm weather finally arrives. How can we even talk men’s style if we aren’t talking about the man behind menswear site, Levitate Style? Working in the industry helps Chan push conventional style boundaries, which definitely gives him an edge on the competition. His precisely styled coif perfectly complements his classic prep style. Freshly washed hair is mandatory for a look this clean – get the best wash with AXE’s Urban Daily Thickening Shampoo with Caffeine. More often than not, you can find Oscar in a dark, sophisticated color palette of earth tones and neutrals. He chooses classic cuts and styles that demonstrate what makes classics become classics. It’s clear that the director of Moonlight has great style, just take a look at his cool glasses. Jenkin’s style is pretty classic with a few fun colors and patterns here and there, but the perfectly clean tailoring is what really kicks things up notch. If you don’t plan on hitting the red carpet anytime soon, but you want to go for the gold like Barry with AXE’s Gold Temptation Body Wash. This guy has been all over the place this year and I have yet to not like a role he’s played OR an outfit he’s worn. 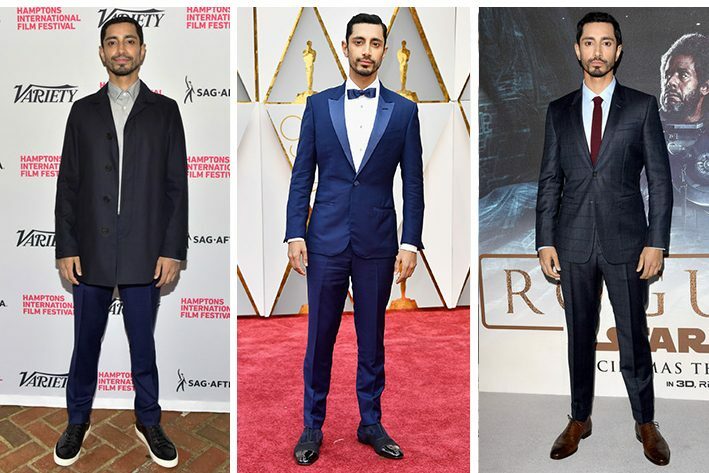 Riz isn’t afraid to flash some style, but he never does so in a way that’s not translatable to the normal guy’s wardrobe. It only makes sense that Men’s Health Fashion and Grooming Editor has great style himself. Brian Boye definitely has fun with fashion, between large scale prints or testing the limits with joggers and cargo pants. As a grooming editor we’re sure Boye knows the importance of hydration, as demonstrated by his wonderful skin. Keep your skin in shape with Dove Men+Care’s Hydrate+ Face Lotion. Denver Broncos’ player Von Miller knows the importance of finding frames that fit your face and his style is in your face. He excels at suiting separates, especially when it comes to injecting pattern and color into suit jackets and pants. Whether he’s on or off the field, we’re sure Von keeps his clothes in tip top shape, and you can too with AXE’s Signature Gold Antiperspirant with 48hr Anti Marks Protection. Music, sports, and style star? We think yes. Sam Hunt may be known primarily and secondarily for his college football career and musician status, but he also brings it on in his wardrobe. Hunt keeps things casual most of the time, but when it does come time to don a suit he doesn’t disappoint. WHICH FACE OFF WAS YOUR MOST DIFFICULT DECISION?